Chelsea and Arsenal could be set for a transfer battle for Barcelona forward Ousmane Dembele as the club look ready to cash in on him for the right price. In a surprise development considering the young Frenchman’s fine start to the season, Chelsea and Arsenal are listed alongside Paris Saint-Germain as the clubs Dembele has offers to join, according to Don Balon. The 21-year-old has long been regarded as one of the brightest prospects in European football, and he’s finally started to show his best form for Barcelona this season after a slow start. Still, another Don Balon report similarly suggests Dembele’s future at the Nou Camp is in some doubt as Barca are ready to sell the player if they receive offers of around the price they paid Borussia Dortmund for him last summer. According to BBC Sport‘s report at the time, Barcelona paid an initial £96.8m for the France international, so that would be big money for the likes of Chelsea and Arsenal, but perhaps less so for PSG. 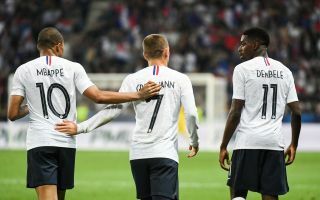 Still, the French giants already have Neymar, Kylian Mbappe and Edinson Cavani in a world class front three, while the Blues and the Gunners look in need of improvement if they are to establish themselves as Champions League sides again. Dembele may have struggled at Barcelona, but if he made his way to the Premier League it could be a very exciting deal for neutrals as well as for the fans of whichever club landed him.